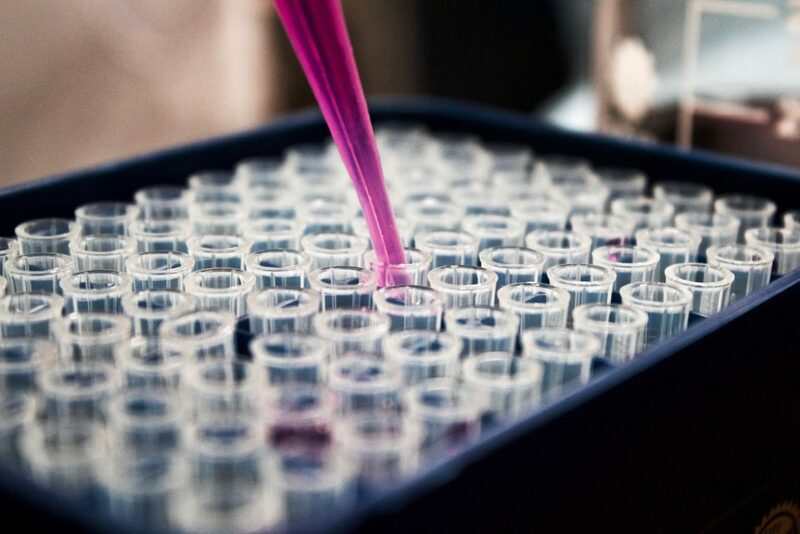 The global medical device market is expected to reach an estimated $409.5 billion by 2023, and it is forecast to grow at a CAGR of 4.5% from 2018 to 2023. We even felt gracious working in a field that supports enhanced quality of life for elderly, care extended by technology, reduction of physical and mental burden for caregivers at the end of the day health benefits for all. Robotic technology in the field of health has had a great impact in recent years. In fact, by 2019, the application of artificial intelligence in robots to work dynamics is expected to increase hospital productivity by 10 to 15 per cent over the next 2 or 3 years, according to Forbes. There is evidence that many of the tasks traditionally performed by humans are being replaced by more efficient robots, not only in the field of health but also in many other sectors. However, the evolution of this replacement will also depend on the degree of innovation in each country. At present, the medical sector has robots, mostly directed by human beings, to do many daily tasks. The challenge for the next few years will be to make these tasks autonomous as well. But what are these robots, what do they do and how do they improve medical care? 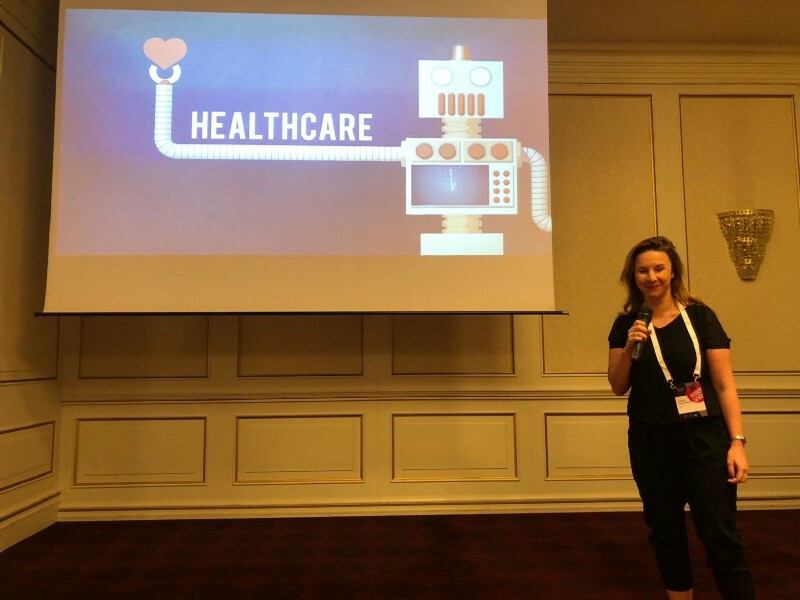 One of the most important tasks, with the greatest number of investigations written about it, is patient care and the social interaction capacity of the robots. In other words, robotics for care and rehabilitation. However, there are also many other applications that are triumphing in the sector, such as surgery through less incisive and more precise robots. In fact, according to Analytics Insight, the most important robotics companies belong to this sector for the most part. One example is Medrorobotics, which provides invasive surgeries to patients. It even launched an assisted platform to help surgeons in their operations. In this post, we will focus on describing some of the most important applications in the field of social interaction with humans. This aspect faces one of the main challenges in this century for the robotics sector: to know how humans can interact with robots. An example of these interactions can be found in a person who needs a robotic prosthesis to do an activity. In fact, even in medical recovery, people can be guided by a robot and not by a doctor. A study published in ASME (The American Society of Mechanical Engineers) states that, after doing case analysis, people trained with robots after a stroke do not show any difference compared to those treated with a traditional therapy measured by humans. These types of robots help people regain certain capabilities they have lost. For example, in people with physical disabilities. They are very important robots to improve people’s quality of life. They can also be essential for recovery after a stroke or spinal cord injury. Similarly, there are robots that will replace functions such as accompaniment. Nursing homes in Japan are already using robots that care for the elderly. The Shin-Tomi nursing home in Tokyo uses 20 different models of robots to care for its residents. Hirohisa Hirukawa, director of robot innovation research at Japan’s National Institute of Advanced Industrial Science and Technology, told The Guardian in an interview that “the goals included relieving the burden of nursing staff and increasing the autonomy of people still living at home”. 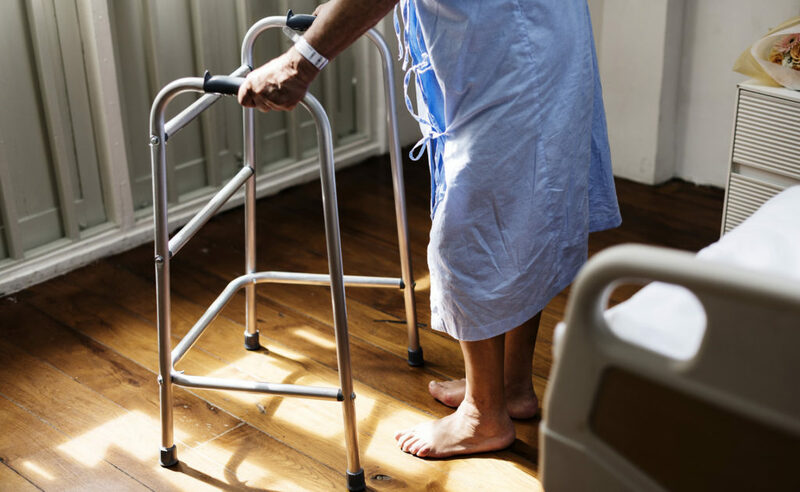 Moreover, the Japanese government has established a strategic plan that expects four out of five people in need of care to agree to robot support by 2020. If you want to learn more, watch the following video. 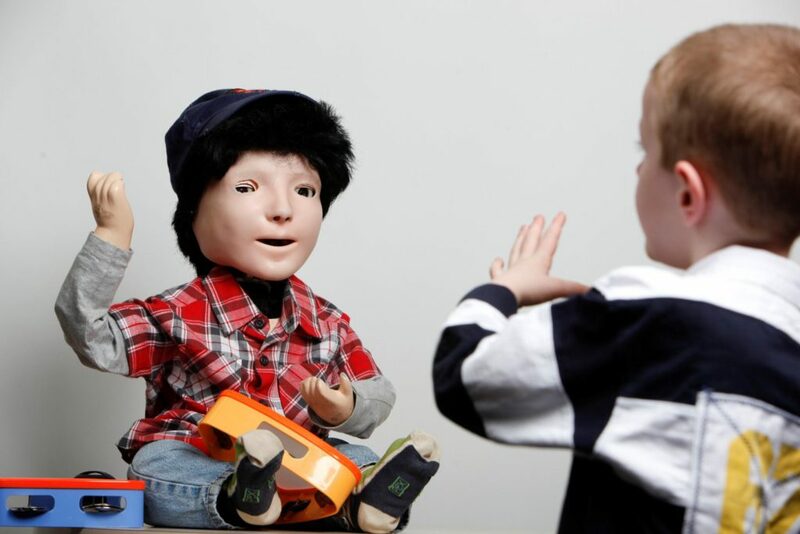 A robot’s ability to socialize can also help children with diseases such as autism, as is the case of the British robot Kaspar, created two years ago, which has helped thousands of children in England with autism who have problems with socializing. But what can a robot offer that a human being cannot? In this case, Yale University researcher Brian Scassellati explains in a video how robots possess the degree of socialization indicated for a person with autism since they are not as social as humans and do not cause them anxiety. For this reason, robots do not seek to overcome human capabilities, but to complete them. Researcher Brian Scassellati tested his theory through 12 families with autistic children. The robots interacted with them every day for 30 minutes over 30 days. The results were better than expected in all areas. For example, children interacted better with people, were more sociable and able to cope with everyday situations. Many areas of medicine and science can benefit from robots, including neuroscience. In fact, according to scientist Zachary Mainen, there are many similarities between a brain and a robot programmed with artificial intelligence. Let’s say that software with errors could be a likened to a depressed software. This software would need new ways of capturing information in order not to have any errors. The same can be said of people. They need to reconstruct the information they have in their brains in order to cope with depression. For this reason, Mainen argues that the evolution of artificial intelligence toward greater flexibility will help scientists understand illnesses such as depression or schizophrenia. Of course, a machine can never understand suffering, however, it can give some guidelines on how we can deal with illness and whether current therapies are the right ones. There are areas in different, more isolated countries that do not have constant medical care. Today, there are already robots that can diagnose a patient through artificial intelligence. The Japanese firm iFlytek has already developed a robot that has passed the exams required to practice in a hospital in the city of Hefei. For now, the robot is supervised by a human, who must qualify their diagnoses. This video shows you how the robot works. 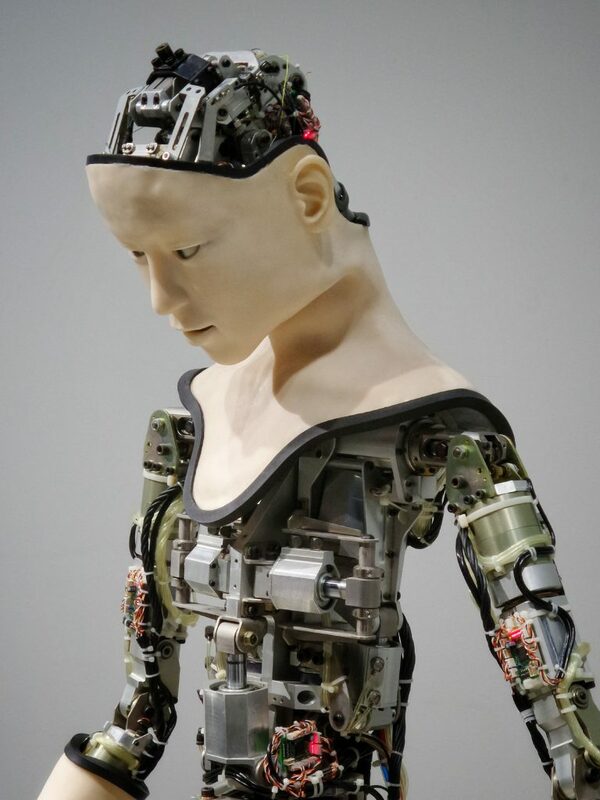 The relationship between human and robot will be very important in the coming years. For now, the human being will have to take care of the robot, but maybe someday the shoe will be on the other foot. 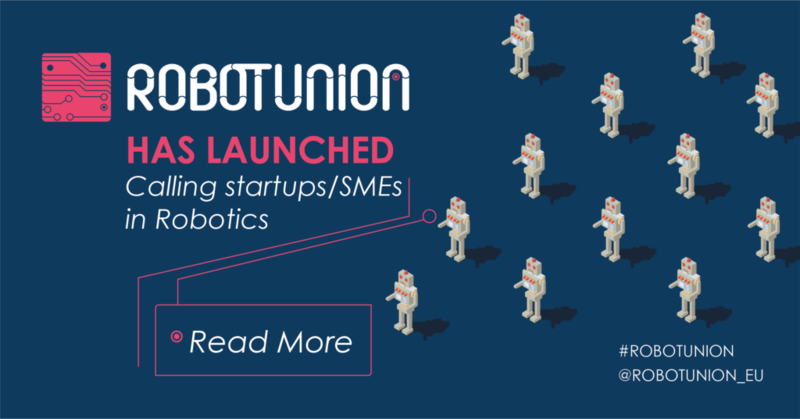 RobotUnion is an initiative designed to increase the number of startups and SMEs in Europe in robotics-related fields. We will invest €4 million in 40 companies during 2 open calls from 2018 to 2020 and will provide them state-of-the-art technical support and access to “premier-class” technology, World-class Training and high-level Business Mentoring, Internationalization services and Engagement with world top industry leaders. Are you looking for opportunities to gain funding and interact with big players in the robotics field? We have the perfect opportunity for you! We are currently looking for robotics startups to join our 2nd call (open until the 30th of April at 1 pm CEST), below you can find de dates and places where our info sessions will take place. 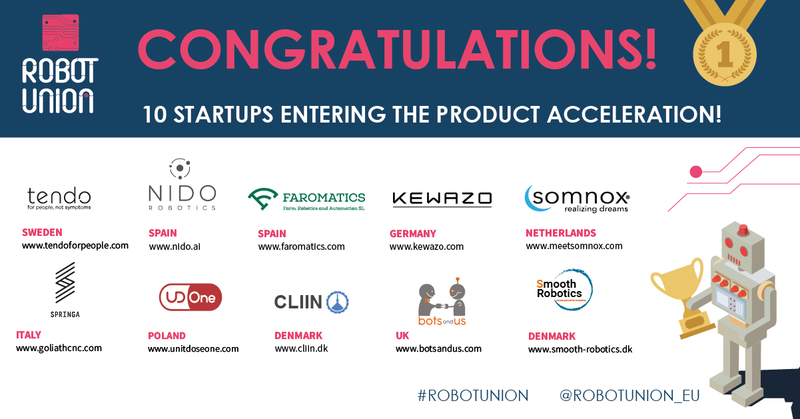 RobotUnion is the first European acceleration programme that aims to discover, support and fund startups and SMEs in the robotics industry. Launched within the framework of the European Commission’s Horizon 2020 programme. Would you like to become a part of Robotics revolution together with RobotUnion Startups and Consortium? Join our pool of experts and facilitites! a) Technical Facilities for running the Proof of Concepts. c) Business and Funding Mentors. To join the RobotUnion Marketplace which will gather state-of-the-art technical support services and mentors which will provide access to “premier-class” technology to selected Startups. Those who will pass successfully through the validation procedure will be included in the RobotUnion marketplace and will be taken into account for matchmaking between services offered and Startups request. You will become a part of the prestigious Robotics Marketplace created together with top Research and Technology Organizations like VTT, DTI, TU Delft, TECNALIA, and PIAP and top industry leaders such as MADE representing world Manufacturing leaders like Danfoss, Grundfos or Vestas among others. ARLA in Agri-Food; FENIN in Healthcare and FERROVIAL in Civil Infrastructure. You can be paid up to 60.000 EUR according to the services you provide to one or more startups. If you apply to be part of the marketplace you will be announced for all the startups of our programs and if any of them wants to collaborate with you we will contact you and set up an agreement with the conditions for the collaboration. What is a social robot? They are robots where social skills and interaction play a key role in their development. They should be capable of showing emotions, have capacity to carry an advanced level conversation, understand the mental models of their social partners, have relationships and maintain them, use natural communication cues and learn social capabilities, as described by Thosha Moodley. For professor Mary-Anne Williams, social robots are designed to work with people safely and efficiently, and to add value to people’s lives by helping, caring, teaching and entertaining. Rotos are already among us and you can find them everywhere from the operating theatre to the bottom of the ocean. This should raise the conversation around their design, capabilities and legal status. And last but not least, where are social robots going? As we have heard numerous times, the robots are coming — and they’re coming in larger numbers than ever before. Especially in manufacturing, robots have made their mark on industry and today 44 % of all Danish SME manufacturing companies use robots to some extent (Danish Technological Institute 2018). Three years ago, only 31 % of the same group reported that they are using robots. There’s no indication that this development will slow down in the coming years. In fact, new technological solutions are constantly popping up across the manufacturing landscape making it possible for SMEs and other companies to use robots for new tasks in new industries. MADE is involved in multiple collaborations surrounding the use of robotics in manufacturing. 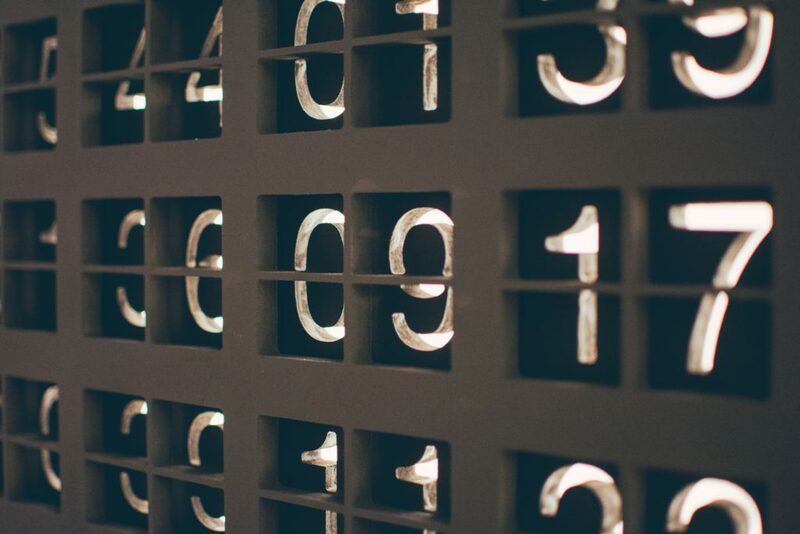 In this article, I will present a few of the trends we are seeing around industry and academia in the area of automation and robotics. Collaborative robots — or “cobots” — will be hard to miss in the coming years and are currently an important focal point for many actors in the manufacturing industry. By getting humans and robots to work together more closely, companies will experience an array of new options for automation of tasks that are currently not feasible with existing technologies. The core function of the cobot will be as a tool to deal with simple, repetitive part-tasks, while the human can focus on problem solving and more complex tasks. But ensuring a smooth cooperation between robot and human operator still requires a lot more R&D, especially when the most important job is to ensure the safety of the humans that will be working side by side with robots. In 2019, we’ll also be focusing on making robots more intuitive to use and adding higher levels of intelligence to them. In order to make robots more accessible for companies and specific tasks, manufacturers must focus on increasing the user friendliness and flexibility of the robots, and the supporting equipment such as part feeders and grippers, which is why they’re working on making the programming and the set-up process of a robot more intuitive. For example, by using robotic modules, businesses can pick and choose between standard modules designed to enable a robot to be adapted to a specific task or enable the production of a specific product. We’ll also be seeing more robots having integrated AI and machine learning which will make them faster learners and able to optimize their own performance and adapt to component and process variation which would typically cause a production stop. While the robotic arm itself is one thing, another thing is all the components attached to it or surrounding the robot as a whole. We expect to see robotic add-ons and accessories becoming even more coveted in 2019. These add-ons could be anything from tools and grippers to software, vision systems or feeding systems that help the robots with their grip and vision challenges and much more depending on the add-on. 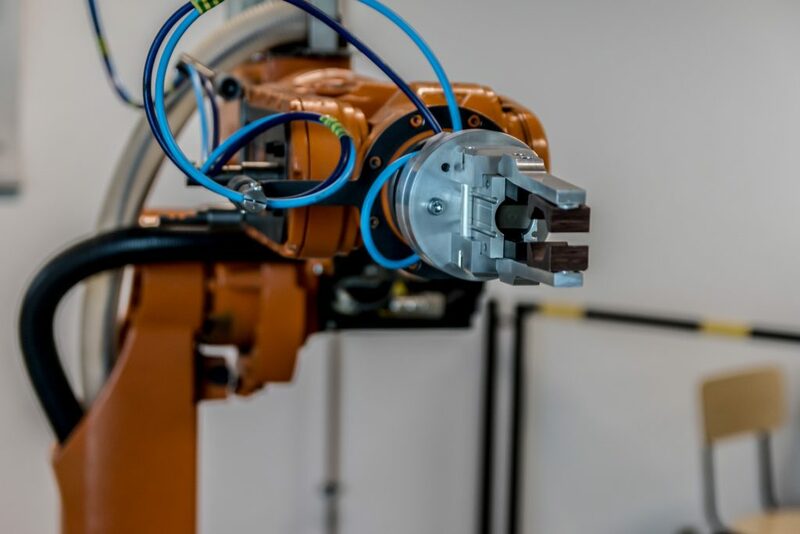 In Denmark within this area of robotic accessories, we’re seeing a lot of interesting potential for growth, especially for companies specializing in this aspect of robotic technologies. Of these we find feeding mechanisms especially interesting. Feeding mechanisms help present the right object to the robot arm in order for the robot to grab the object and transfer it to where it needs to go. Developing smart feeding solutions is important for robots in the manufacturing industry since the industry is becoming more and more interested in producing smaller series of products and the handling of these small series requires new solutions. The traditional solutions based on vision systems and vibratory bowl feeders are usually both expensive and difficult to reprogram for new objects to be picked up restricting their application to large production volume and limiting the application of automation in SME’s. MADE among other actors are very interested in gaining insights about up-and-coming solutions and hopefully 2019 will be a big year in robotics research. What are you excited about for 2019 in the robotics realm? An event, a company, a project or technology? Join I4MS Community and let us know in the comments. 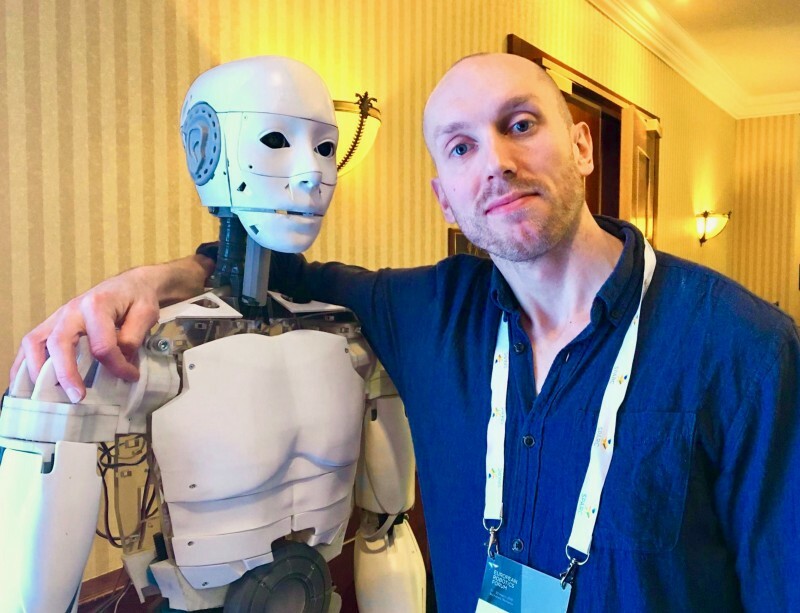 Win a fast track to the RobotUnion jury day 2019! We invite all entrepreneurs and potential entrepreneurs in the robotics field to join the competition for the prestigious Entrepreneurship Award. The euRobotics Entrepreneurship Award is given out each year at the European Robotics Forum (ERF) to the most promising robotic start up as judged by a jury of robotic entrepreneurship pioneers and experts. Entrants to the competition stand the chance to gain valuable skills in how to pitch an investment idea together with the potential to gain interest in their company from the robotics and investment community. 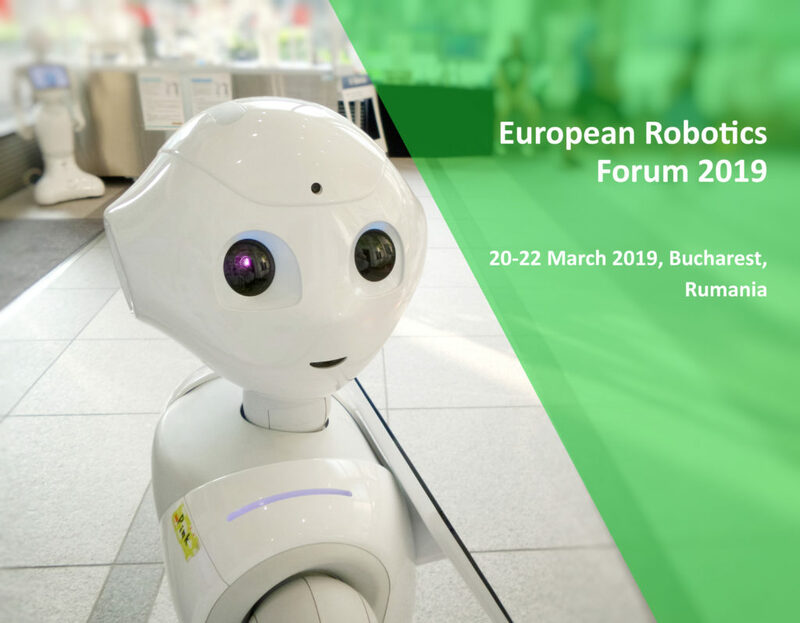 The 2019 edition of the Entrepreneurship Award will take place on 20-21 March, at the European Robotics Forum 2019, in Bucharest, Romania. Each selected participant will have their flight and accommodation (up to € 500) and ERF attendance fees paid for one person, and will furthermore receive feedback on their pitch and project from the screening committee and an offer of a further 3 * 1 hour of counselling from European level robotic entrepreneurship experts. Three participants will be selected as Finalists and pitch in the open Entrepreneurship Award workshop along with robotics entrepreneurship role models, and will receive a Finalist diploma, an ERF banquet fee paid for one person and recognition on stage during the ERF banquet. The Entrepreneurship winner will additionally receive extensive coverage on ERF social media and recognition in ERF public promotion materials and in an press release and an ERF Entrepreneurship Award winner diploma and announcement on stage at the ERF banquet. The objective of the workshop is to encourage the wider acceptance of entrepreneurship in robotics researchers by providing Entrepreneurial coaching to several teams who themselves have ideas for developing robotics products or services. The workshop will take place over three sessions on 20March. The first and second sessions are private screening and coaching sessions, and will take place between 8:30 and 10:30 and again between 14:00 and 15:30. Each participant will be invited for just one of these private sessions. All participants will receive feedback immediately after 15:30 on 20March, and the three selected Finalist will be invited to pitch in the Entrepreneurship Award 2019 workshop on 20 March between 16:15 and 17:45. The first two sessions will be closed sessions for the entrants only, while the last session will be open to all ERF participants, and will also feature role model presentations by a successful robotic entrepreneur. Three sessions will be held. The first two are private pitching and discussion sessions at which the 10 best entrants are invited to individually pitch their ideas to a panel of expert robotic entrepreneurship coaches. 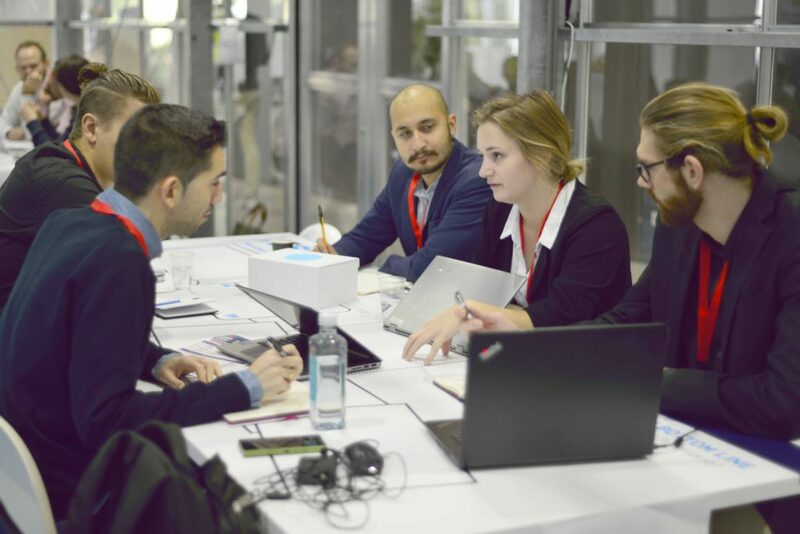 These sessions will result in three entrepreneurs going forward to the ERF Entrepreneurship Award workshop – the three finalists will do a public pitch in front of a jury of robotics entrepreneurship role models and experts. This jury will then consider the presentations and declare a winner of the Entrepreneurship Award. The private coaching sessions will involve each selected entrant pitching their existing business in a 10 minute slot followed by questions from the panel. The number of entrants will be restricted to a maximum of 10. If we receive more applications, the organizers team supported by some of the coaches will select the most promising or innovative ideas based on the application. 1. The first, second and third sessions will be closed sessions. 2. The fourth session will be open to all registered attendees of the European Robotics Forum. 3. It is suggested that presentations be kept to information you are happy to be in the public domain. 4. If there is any information that you feel is essential to your presentation but you do not want to be fully public then this can be discussed with the coaching committee during the first sessions, but no NDA’s will be signed by the coaches. The entrants will be followed by a team of expert coaches, that are also open for follow up counselling after ERF. Robotic entrepreneurship role models and experts will form the jury, and could give specific input and assistance in the further development of your investment pitch and your company. How can participants contribute to, and prepare for, the workshop? The participants are expected to have already developed an idea for a product or service and done some background work in researching the marketplace in which it could be exploited. 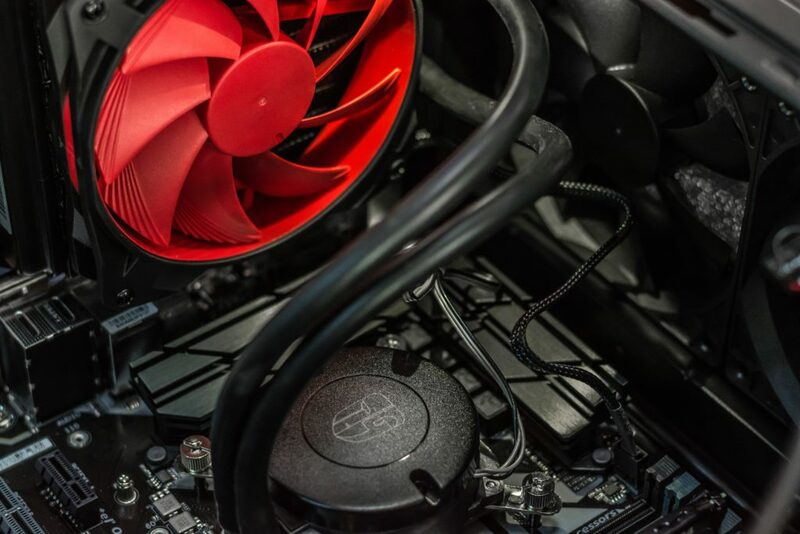 Entries can be both individuals who have not yet established a company or teams with established companies and proof-of-technology, but without sales and turnover yet. However, only one person will be subsidized to join the event. Which problem/opportunity in the market, that you are addressing with your idea? What is the market size for your solution? Which are the existing solutions? (the competence) and how do you compare them to your solution? At which level of development is your technology? Which are the next steps? What is your roadmap from here? Do you have access to the right competencies or a good plan on how to acquire them? In order to promote the participation of entrants from different European countries, accepted entrants will be entitled to the cost of transportation and accommodation covered for one person until a maximum of 500 euros. The ERF registration fee for one person will be covered by euRobotics aisbl. Each of the three finalists will be entitled to the cost of the ERF banquet for one person. This event is sponsored by euRobotics aisbl and Odense Robotics. Great news are coming for the 1st RobotUnion Acceleration program! Last 2 months Technical and Business Mentors were working with 20 Startups who has started a Feasibility Stage on Welcome Camp in Delft in November 2018. They all had to focus on creating the Feasibility Plans which were presented to the RobotUnion Jury in the middle of January 2019.